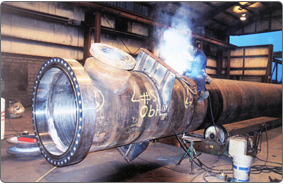 Alliance Fabricating Ltd. aims to be the preferred provider of Shell & Tube Heat Exchangers, Hairpin Heat Exchangers, and Pressure Vessels by providing personalized service, outstanding quality, and competitive pricing. We will consistently strive to provide value to our Customers while providing a safe, secure environment for everyone who works in or visits our facility. © 2017 Alliance Fabricating Ltd. All Rights Reserved.